If you’ve been following Lillian Karabaic’s Oh My Dollar! 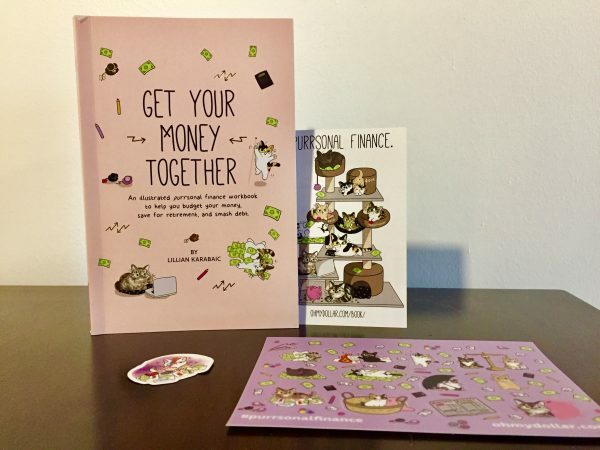 podcast, you probably already know about Get Your Money Together, a “purrsonal finance” workbook that provides an action-based, cat-illustrated guide to getting your finances in order. Maybe you even contributed to the Kickstarter (I did!). I contributed at the “digital book” level, but Lillian sent over a print copy in the hopes that I would share it with The Billfold — and if you also signed up for the digital copy, I HIGHLY RECOMMEND UPGRADING TO THE PRINT VERSION. This book is beautiful. I had a bit of behind-the-scenes access to the publication and printing process, and I know just how seriously Lillian took the whole thing; this isn’t one of those POD-on-the-cheap paperbacks. The cover has raised gilt embellishments. There are full-color illustrations (by Lucy Bellwood and Fiona Wu) on nearly every page. The book looks and feels so good that it increases the value of the whole endeavor — both Lillian’s and the one you’re about to take within its pages. Making more money, especially if you are living close to the poverty level, can definitely help your financial wellness. I’m not denying the power of “more money.” But no matter how much money you make, if you don’t fix your relationships with money, you’ll never really get out of the financial litterbox. You’ll just create even bigger money problems for yourself. And a modest income with good money choices CAN make all the difference. What I love about this book is the way it incorporates so much of the information you might find in, say, The Value of Debt in Building Wealth (the discussion of renting vs. owning, for example, is pretty much identical) without presenting “wealth” as the end goal. A lot of personal finance books invite readers to imagine their future selves with a big pile of money. Get Your Money Together asks you to imagine what life might feel like if you felt comfortable about where your current pile of money was going. It also includes a lot of cat puns, cat illustrations, and — my favorite part of the book — the Cat Tree of Financial Well-Being. This graphic gives you a clear action plan for managing your money: first, start budgeting and save a one-month buffer, then contribute up to the employer match on your 401(k), and so on. If you never make it to the top of the cat tree, that’s okay. You’ll increase your financial well-being with every level you climb. I’m either at the top level of the cat tree or the next-to-top level, depending on how you calculate retirement savings if you don’t have a 401(k). Which means Get Your Money Together isn’t necessarily the best financial book for me. But it’s the kind of book I’d want to give a young person as a college graduation or 21st birthday present, especially if they love cats. I also want to recommend it to any Billfolders who feel like they don’t know what to do next, financially — or Billfolders who think they know what they should be doing next, but are procrastinating because that next step doesn’t match their values. I also recommend it to anyone who likes workbooks, self-reflection, David Bowie, stickers, or books you can write in with glitter pen. If you don’t have a stash of glitter pens at hand, ordinary pens will also work — but this book feels special, and I think you’ll want to treat it that way. That’s also why I think the book will be successful; we prioritize what we value, after all, and this book is so valuable, both in terms of appearance and content, that it’ll encourage you to prioritize your own financial journey.